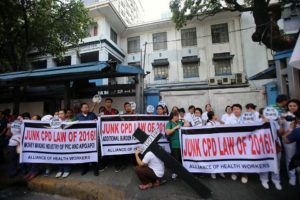 From the latest reported news through Philippine Daily Inquirer, a nursing group revealed their disappointment about the latest requirements that the Professional Regulation Commission (PRC) has imposed for the renewal of their professional licenses. The new Continuing Professional Development (CPD) Act covers such guideline. According for the published news report online, the nursing group decided to express their voice over their disappointment when renewing their licenses as professional nurses in the Philippines. “Given that the laws like RA (Republic Act No.) 9173 — or the Nursing Law of 2002 — and the Magna Carta for Public Health Workers, which uphold the best interests of nurses, are little implemented and generally disregarded and violated, now comes another law that will further burden the already weighed down nurses,” said the Filipino Nurses United (FNU) in their statement as quoted by the PDI. The group added that this would be an addition burden for them, especially for those underpaid professional nurses already. Based on the new guideline, a professional or a nurse can only renew the license after earning at least 45CPD units. The CPD Act is one of the bills authorized by Senator Antonio Trillanes IV and approved by the PRC. The commission however already the latest guidelines about the implementation of the law, which the professionals need to read and understand. The group likewise believed that although the new law is aiming to improve the performance of the nurses in their field of job, it appears that the focus of the CPD Act of 2016 is to meet the Association of Southeast Asian Nations (ASEAN) integration fundamentals. From the point of view of Junven Lavapie, the integration permits citizens of other members of the ASEAN to enter the Philippines and practice their professions in the country. Unfortunately, professional Filipinos cannot do the same thing if they go to other Asian countries. In line with this issue, the Optometric Association of the Philippines (OAP) shared the same point of view with the FNU and asking for the review of the new implemented law. Many affected professionals are certainly waiting for the action and decision of the PRC, on whether it makes changes or not.